← Feeling Pretty? You Should! One of my all time favorite lunches. 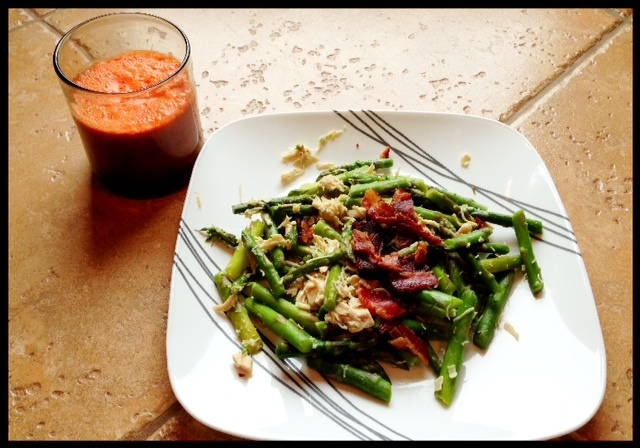 Steamed asparagus with some chicken and bacon, and some *fresh* carrot orange juice! I love my dad. He taught me the ability to make a dollar stretch if need be. I never knew how much I would need those skills until I became the one footing bills for things. Being smart about money was a gift that helped in college and in married life. As a wife of a retailer, we have good years, and bad. Early on, we weren’t able to save or predict those bad years – so we went without. That’s what we’re supposed to do when we can’t afford things. Figure out how to make money to make it work, OR go without. With living and eating gluten free, a big concern seems to be price – that some how living this way is “a lot more expensive”, and people can’t afford it. In reality, it is only certain products that are more expensive, and yes – you might have to reprioritize your life to make it work. I’m going to share a tip with you regarding Vitacost. I love this company because they offer many supplements that I get, and food products as well. While we don’t eat many processed foods, because of their expense – and knowing real food is more nutritious, we do like to have a few options. First off – I got to www.ebates.com If you don’t have an ebates account, you should. Even if Vitacost is the only place you shop online. (I’m sure it’s not). But any online shopping, you start at Ebates. Because they will mail you a check quarterly in a rebate form, for your purchases that start there. Advertisers pay them to promote their brands, and in turn – part of that rebate is sent to the consumer. This is effective and cheaper for the stores than click-through advertising, plus it’s all in one spot! So, often times I wait until I get a sale notification from Vitacost.com that they’re having a sale. Last week they had a sale for 12% off. I also got another 12% rebate from ebates in my ebates account. On a $550 order, I saved almonst $60! Last year I no clue what were the best prices of things, but now I have ball park figure amounts, so if you don’t either – don’t feel badly, we all start somewhere. But it’s helpful to know, so I know when to stock up on things!!! I realize most people don’t spend $550. We don’t either honestly, but sometimes when we have a large supplement order, and we are preparing for vacation stock up – we do. But you get the point. Over time – the savings adds up. In the mean time – if you can’t do perfect, try to do your best. Don’t beat yourself up. Negative stress isn’t healthy either!! Not everyone can eat everything organic at first. I totally get that. But cutting gluten out of your life is one of the biggest health decisions you can make. That is a decision you won’t regret. Both Vitacost and Ebates have referral programs where you can earn $$ too, when your friends and family use your name of who sent them. Other great way to add to your bottom line and help others you love! Posted on April 9, 2013, in Celiac/Gluten Sensitivity, Change, Label Reading and tagged celiac disease, ebates legit, healthy for him, saving money eating gluten free, Vitacost. Bookmark the permalink. Leave a comment.